If you missed our introduction of the LA Fashion Bloggers, please click here to catch it! Special Announcement! You DON’T want to miss out! The Ladies of LLL will be joining LA Fashion Bloggers, Haute Pink Pretty, Spoiled Little LA Girls, Live Love LA, and Walk in Wonderland in a LIVE Hangout TONIGHT at 9 pm pst! 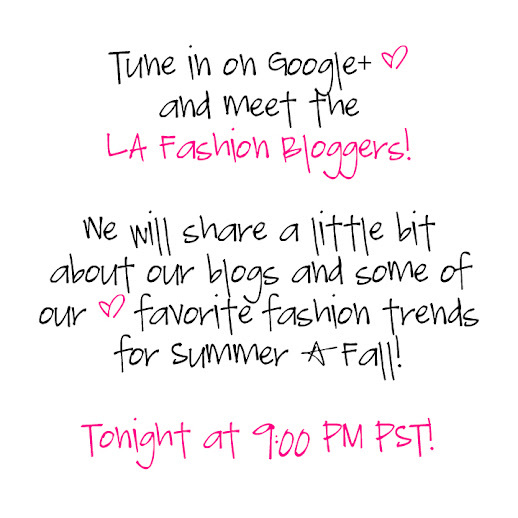 Follow LA Fashion Bloggers on Google+ ! !